On the 17th of December Frances prime minister went onto live TV, with the minister of interior on his right hand side and that of the environment on his left. He was going to finally announce the government’s decision about the airport of Notre-dames-des-Landes and the fate of Europe’s largest defensive land occupation, the ZAD. The destructive infrastructure project, on the western edge of France, has been resisted since its inception 50 years ago, and over the last decade it’s 4000 acres of land have been squatted and turned into a giant laboratory of commoning, with over 100 living spaces and several hundred people occupying and working the land. Drawing attention to aviation’s contribution to climate change is timely. Publication of the video coincides with a meeting of the International Civil Aviation Organization (ICAO) in Montreal, Canada, which agreed a deal which purports to curb aviation’s emissions of climate change causing greenhouse gas emissions. This is urgently needed as the aviation sector is one of the fastest rising sources of emissions. But, under the deal, airlines will not face a cap or charge on their emissions. Instead, offset schemes will enable airlines to pay for carbon reducing activities such as forested area and emissions cuts in other industries. Aviation growth will continue and the deal will do little to reduce emissions. The aviation industry is not committed to aligning its long term targets with the 1.5°C – 2°C temperature increase limits of the Paris agreement on climate change, which has now come into force as it has been ratified by a sufficient number of countries. The Stay Grounded actions around the world conveyed serious messages of the damage of aviation expansion with energy and humour. In France an unnecessary new airport in Nantes threatens to destroy farmland, forest and biodiverse wetlands. Farmers and activists have resisted the project for 40 years. The 4,000 acre site is protected by the ZAD (Zone a Défendre) community, which may be facing imminent forced eviction and has issued a callout for support. The video shows a massive march, dancing and dozens of carpenters working together to construct a building to form the base for resistance to eviction. In Turkey, North Forest Defence has held a great many protests against destruction of forests, lakes, farmland and coastline for Istanbul’s third airport. Every day thousands of trucks move earth for preparation of the construction site. In Germany, campaigners hold demonstrations in Frankfurt Airport terminal every Monday to protest against expansion of the airport. A fourth runway opened in 2011 and construction of a third terminal began in October 2015. A planned new Mexico City mega-airport on the site of Lake Texcoco would lead to water shortages and a devastating impact on farming. Farmers have resisted an airport in the area since 2001, and suffered state oppression and violence. There was a protest on affected farmland and an academic forum and study visit. Campaigners opposing a third runway at Vienna Airport dropped a banner from a bridge over a highway, held a massive bicycle rally (one of the tandems is towing a piano), and there was a performance by a breakdancing polar bear. A third runway is planned at London’s Heathrow Airport, where the Stay Grounded action included a critical mass bike block and flash mob and ‘die-in’ in Terminal 2. A privileged elite take the majority of flights and a frequent flyers’ check-in, with activists playing privileged passengers climbing over protesters, highlighted the inequities of aviation growth. Uzma Malik, an activist from Reclaim the Power, reflects on the protest, outlining some of the loopholes in the ICAO deal and details of the action such as the reading out of testimonies from people living on Pacific islands and in Africa whose lives are already being devastated by climate change. Also in the UK, Gatwick Airport is planning a second runway. Stay Grounded protest took the form of a picnic in the terminal, accompanied by a bagpipe player. Below is just one example of the great photos taken by Rob Basto. In Montreal, a press action was held outside ICAO headquarters by the People’s Coalition for Responsible Civil Aviation, drew attention to the greenwashing of the ICAO climate deal. Also from Canada, a fantastic solidarity message from Land over Landings, a group which has resisting an unnecessary third Toronto airport on prime quality farmland in Pickering for over 40 years. The ‘Stay Grounded’ global wave of action against airport expansion shows that local campaign groups around the world are linking up. 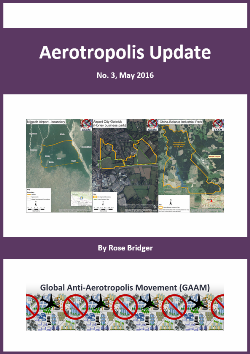 Resistance against aviation expansion is gathering momentum. Connections and solidarity between groups resisting airport projects that damage local environments and communities – causing air pollution and loss of farmland and biodiversity – are strengthening. Building on this international solidarity is vital to tackling the global issue of aviation’s contribution to climate change. officials have coined this place “a territory lost to the republic”. Its occupants have named it: la zad (zone a défendre) zone to defend. The ZAD (Zone A Defendre or Zone to Defend) in France is variously described as an occupation, a no-go area of radical militants, a resistance community, and the proposed second airport for Nantes. During my first visit to La ZAD I explored some of the reasons that people have made this beautiful place their home. Defending the zad: A new little book about the struggle against an airport and its world. A book written by some of the occupants of the ZAD (Zone a Défendre) – a site in Western France which has been occupied for over 9 years – in resistance against the construction of the planned Notre-Dame-des-Landes airport. Over 5,000 acres of farmland and wetladns would be destroyed. Evictions and mass protests are documented, and the sustained solidarity which has held the ZAD together for so many years. The ZAD is a ray of hope in the resistance against destructive megaprojects. “You are entering a free territory: Here the people decide” Signs set up during the tender weekend (Jan 30-31 2016) where 1000 helped build and mend things on the zad. We at the Labofii just translated this beautiful little booklet about la zad into english, feel free to download the pdf and spread far and wide. Defending the zad is part voices of struggle, part historical chronology and manifesto, it works as a great update to one of our most popular blogs on this site, Rural Rebels and Useless Airports, published in 2012 during the attempted expulsion of Europe’s largest land occupation at Notre-Dame-des Landes.